Pirinase Hayfever Relief for Adults 0.05% Nasal Spray is used to treat the symptoms of hayfever including sneezing, itchy and watery eyes and a runny, itchy or blocked-up nose, for up to 24 hours. The active ingredient is fluticasone propionate, a corticosteroid which, when used every day, has an anti-inflammatory action and works in a similar way to natural body chemicals to control inflammation. 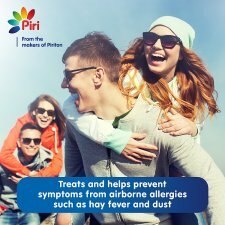 This spray helps to control your body's reactions to allergens (pollen) in the environment. Users normally need only two sprays into each nostril once a day. Dosage: For adults ages 18 years and over, 2 sprays into each nostril once a day, preferably in the morning. Once symptoms have improved, use one spray per nostril once a day. Use the lowest dose that effectively controls your symptoms. Do not use more than two sprays in each nostril per day. 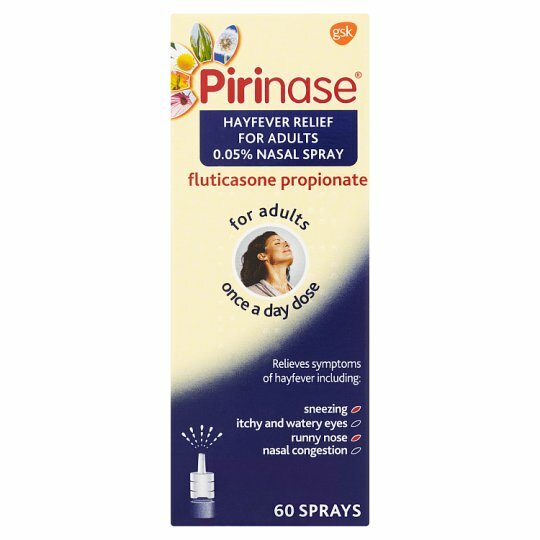 Pirinase Hayfever relief for Adults 0.05% Nasal Spray contains fluticasone. Always read the label. Use only in the nose. Usual dose: 2 sprays in each nostril, once a day. If your symptoms improve use 1 spray in each nostril once a day. Children: Not for use in children under 18 years. DO NOT USE Do not use if you are taking medicines for HIV. Do not use more than 2 sprays in each nostril in a day. Do not use for more than 1 month continuously without consulting your doctor. CONSULT YOUR DOCTOR Before use, if you are pregnant or breast-feeding. If your symptoms have not improved after using the spray for 7 days. Keep out of the sight and reach of children.